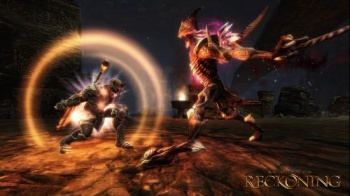 EA wouldn't fund a sequel to Kingdoms of Amalur: Reckoning. But Big Huge Games began work on it anyway. Or so several sources have told Joystiq. 38 Studios was in advanced talks with a publisher - EA apparently passed on the project - when the developer began to implode. "We had a good base to work from, and it was going to be all about improving everything," said an anonymous source. "We listened carefully to fans and critics and were going to implement everything we possibly could." While there's still a remote chance that 38 Studios and Big Huge Games can be pulled from the fire, it seems unlikely that Amalur 2 or the MMO-spinoff, Project Copernicus, will ever be released. While 38 Studios currently owns the IP, tech and code for Kingdoms of Amalur, it's only a few missed payments from having to surrender those assets to its main creditor. Namely, the State of Rhode Island. What's to stop another company from picking up the assets from the state? Well according to sources "close to the discussion," the state's asking price is simply too high, though they didn't release a solid number. Market analyst, Michael Pachter, theorizes that the Amalur IP is worth around $20 million at most. That's less than half the amount 38 Studios owes the Rhode Island Economic Development Corporation. The fact that there was a sequel to Reckoning already in per-production doesn't surprise me. Though Rhode Island Governor, Lincoln Chafee, labeled the title a "failure," it really sold incredibly well for a new IP. Despite being linked to 38 Studios' debt and downfall, the project was actually produced using EA's money. The $50 million 38 Studios borrowed, was actually spent on the Project Copernicus project. In the end, the only thing Reckoning failed to do was earn enough to recoup the costs of an MMO that began development in 2006.